It never ceases to amaze me how much better a great run can make me feel. I’m still only running three times a week, but man did I make those three runs count. Monday was my usual 5-6M at an easy pace, this time including 1M at E’s tempo to make sure I could “feel” the right pace. I nailed it. I love my Monday morning runs – they always clear my head and help me focus. There’s way too much stuff buzzing around in there! I have Nutrition & Health on Monday afternoon, and Physiology (the one I REALLY need to study for this weekend) early Tuesday morning. Not thrilled that the final is at 8am, but I guess it will be nice to get it over with and have the whole day ahead of me to catch up on things like laundry (which I haven’t done in ages), cleaning etc. More importantly, it will give me time to prepare for E’s visit! I haven’t seen him in two months and I can’t wait – he lands Tuesday evening, and even though I won’t get to see him that much between his work schedule and my trip to California, it’s better than nothing. I really hope we get good weather for the Brooklyn Half Marathon next weekend and that I am able to pace him to his goal. A part of me wonders if I’ve lost so much fitness since the NYC Half that I won’t be able to maintain 8:20 for 13.1M, but then I think back to what my usual pace is and I think I should be fine…it will just be slightly more challenging than usual. I’m extremely excited to run our first race together – even if we don’t succeed in reaching his goal, it will be a great experience. 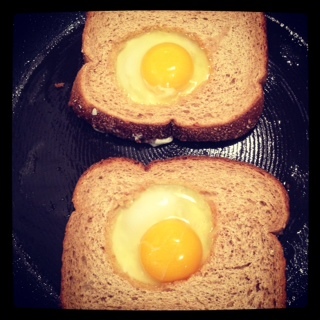 My weekly post obviously wouldn’t be complete without a photo of what I’ve eaten lately, so here’s my current breakfast obsession – eggs in toast (or egg in a hole, egg in a basket, toad in a hole or whatever you want to call it). A friend gave me this idea when she posted this recipe, and reminded me that I hadn’t eaten this in years, and had never actually made it before. Easiest thing in the world. 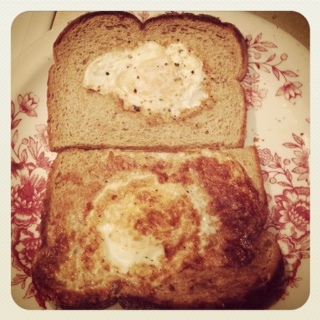 I didn’t follow the recipe – I simply cut out holes in my bread (and ate them, obviously), cracked the eggs into the holes, flipped them over and voila – awesome breakfast. So much more fun than putting a fried egg on top of the toast and it sliding around everywhere (although I do like piling on smoked salmon, avocado etc with a fried or poached egg on top). I used cooking spray rather than butter – I’m sure butter would’ve tasted great and I have tons left over from all my cooking exam practice, but after eating an entire pint of ice cream last night (the perils of final exams…) I figured I should show some restraint! Time to get back to studying – I’ve done very well on my other three finals so I’m hoping I can maintain this momentum for the next three days. It really does feel like the end of a race though – it’s all about mental endurance. I feel burnt out from an intensive semester, but I haven’t worked this hard to slack off now. Three more days – and then a well-deserved break! Enjoy the sunshine and Happy Mother’s Day to all the mothers out there! Hi, I'm Claire! I’m a Registered Dietitian Nutritionist (MS, RD, CDN) and a Road Runners Club of America certified coach. This is where I share my latest adventures in running, racing, food & travel! If you'd like to work with me, please visit my professional website, Eat for Endurance. Happy #Easter to those celebrating! We don’t, but enjoying a lot of quality family time and some much needed downtime today. Had this tasty breakfast bowl of full fat plain Greek yogurt, berries, homemade granola, cinnamon and drizzle or honey. For the granola, I didn’t follow a recipe but threw together rolled oats, cinnamon, maple syrup, salt, coconut oil, pumpkin seeds and sliced almonds, tossed together and baked at 350F. Easy to make and a healthier/cheaper alternative to many store bought versions! Taking advantage of the rainy weather and doing some cooking and baking! Made a huge batch of chicken veg chickpea stew (carrot, onion, eggplant, butternut squash, mushrooms) with lots of spices and broth - so delicious, can’t wait to have a big bowl for lunch after my 75min ride - and making banana bread this afternoon with Arielle! How are you enjoying the day? Pancakes don’t just have to be for the weekend! Whipped these up before taking my daughter to daycare - needed a carb-rich breakfast before my long run later this morning and knew Arielle would enjoy them too. Sometimes I make the batter from scratch, and when I don’t have time like today, I use @kodiakcakes (not an ad, just like this product). I use the buttermilk mix and for 1 cup mix, I add 1 cup milk, 1 egg, a couple spoons of chia seeds, 1 mashed ripe banana, and cinnamon to boost the nutrition even more and add flavors I like. Made small pancakes for A and large for me, topped with almond butter, maple syrup and strawberries. Great fuel for the day and really satisfying, plus there were leftovers so her breakfast is made for the next two days. Win-win! Happy Friday! Loving my new @lecreuset Dutch oven (well, technically it’s a 6 year old wedding gift that I finally had my Mom bring back from California, but new to my kitchen!). It’s still chilly here in NYC, so I threw together this vegan stew yesterday. Also made a big batch of farro with umami seasoning to go with it. Yum! . I don’t usually follow or create recipes when I cook, but this is essentially what I did - heat olive oil, sautée diced onion and garlic with salt, add in a sh*tload of sliced/chopped veggies (I could barely stir there were so many - bag of carrots, box of mushrooms, two massive zucchini, 1 butternut squash) plus two cans chickpeas, 1 can green olives and 1 can diced tomatoes with green chilies. Then add 3-4 cups broth plus spices (cumin, turmeric, and s&p), stir everything, bring to a boil then simmer with lid on until everything is cooked. In that time, make the farro or whatever grain you want, if any. Adjust seasoning, and serve together! Froze a ton and have lots of leftovers for the weekend, which is great because I’ll be solo parenting all tomorrow while E runs the Breakneck Ridge trail marathon, so no time or energy for more cooking! 2014 NYC Triathlon: Dietitian Divas take the podium once again! Boston 2013, here I come! Okay Mother Nature, we get it – summer has officially begun! Real Women Run: My Running Story has been published! Speedwork: The track, treadmill or great outdoors? It’s official: I’m an NYU grad student! Each time you put photos of a egg dish, when evening/dinner time arrives the only thing that will satisfy me is poached/fried/scrambled/hard boiled/ eggs. I’m glad you have E’s visit coming soon and hope the weather holds up and that you have some good times together. Take it easy running. Don’t do any damage to your body. You’re going to need it for a long time so stay as healthy as you can. Happy Spring. Natly P.S. I received the running book two weeks ago and I’ve only read your article at least twenty times. My mom always made eggs like that! We called the cowboy eggs! Hee Haw!